Suzi and I are now in Arches National Park. So I’m doing “best of cookbook reviews.” Back in 2014, I offered this book for your consideration. What can cause more terror for us than needed to be make a beautiful cake. Here is a wonderful, wonderful solution. 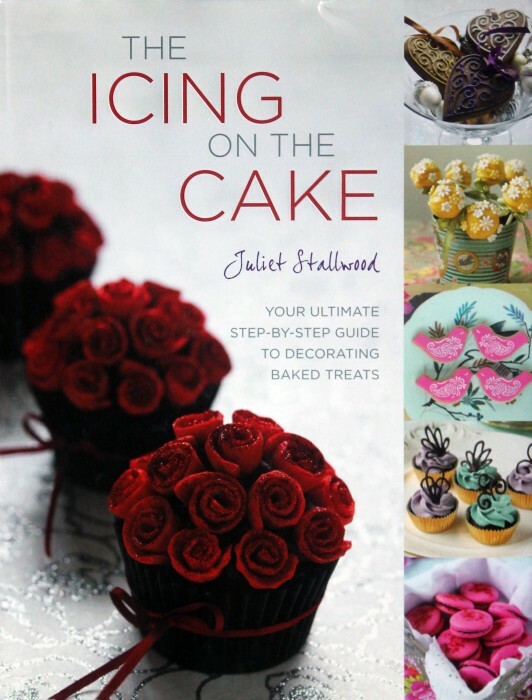 Have you looked and looked for a cake decorating book that you could enjoy? I have and I’ve had a hard time finding a book that I could understand and follow. Cake decorating books seem to fill a special publishing niche. There is a certain style and format for the books that I find confusing. For me, there is either too much or too little information. The techniques are explained in language that I just stumble over. “Fold how? Twist how?” I read the instructions and I look at the photos and I just become dizzy. Now, Suzen will tell you that she has a husband with a high awkward factor, but I don’t think that’s fair at all. I am clumsy, I admit. And I certainly lack patience. But, I want to try my hand at cake decorating. And I don’t want to do it with a heavy hand. I just need help. So I am delighted to say that there is a beautiful new cake decorating book that may help all of us decorating-challenged folks. The Icing on the Cake is the product of Juliet Stallwood. Her story is charming and one that you see often repeated: home baker become business success. She began life as a graphic designer — so she has a high skill set as the pictures here will ardently prove. She moved to Dorset and began home baking but with her refined style. Family and friends were impressed. And they ordered. And it all grew into a business. Look at the novelty cakes link there and prepare to be amazed. She loves to decorate cakes in 3‑D creations that seem to come off a movie set. In this book, you’ll learn some, not all, but some of the tricks and techniques that make her baked goods so distinctive and so humorously appealing. For example, look at these darling party penguins. How could you make these 3-D decorations? It’s marshmallows and rice crispy cereal and lots of gum paste. [Gum paste? Same thing as fondant? No, look for a post tomorrow to explain some cake decorating facts of life.] Juliet gives you brilliant step by step instructions, with photos that do match, to create these Party Penguins. Granted she has inherent skills, ones that I might lack. But it is doable. It’s a matter of patience and getting the training that this lovely book provides. Again, visit the website and you’ll be quite amazed at what a little time and some vigorous imagination can produce. The step-by-step technique for this cake is all laid out for you. It’s not a miracle at all. It’s simply a number of individual steps and some patient craftsmanship. The Icing on the Cake is several books rolled into one. There are these, and many other, examples of completed works. Plus, you’ll find basic recipes for the underlying cakes, cookies [or biscuits if you prefer], frostings and icing. 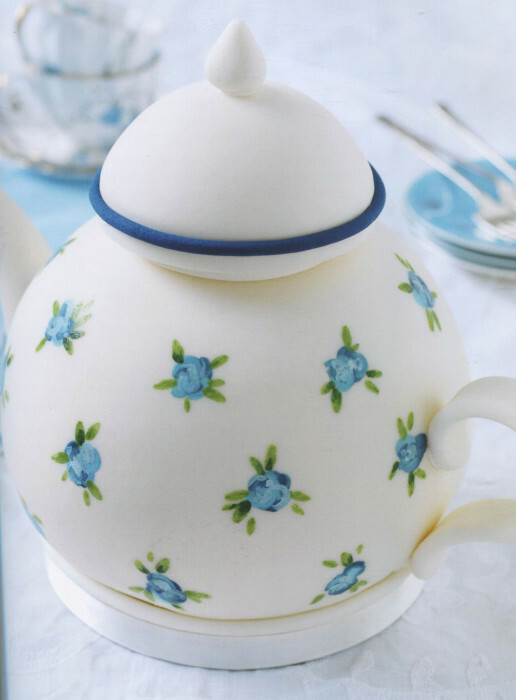 Ever made Royal Icing but had some difficulty applying it? Here you learn about three types of Royal Icing, and how to make them, and most importantly what consistency of icing to use where. Suzen and I are always impressed by quality and imagination. Juliet’s books abounds with both. No, I don’t envision myself making cakes professionally. But to add some of her spectacular features to a party cake would be a noble goal. 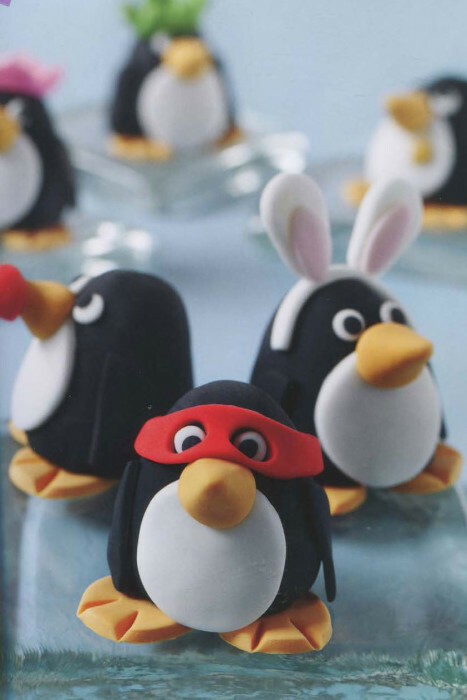 Put a penguin or a mouse on top of your next cake, and you are sure to attract attention and smiles. This is a book to read and enjoy and let yourself be tempted. Oh, the roses on the cover of the book? Gum paste. Easily done if you know how. Read this book, and you will.